If there is one thing that you must know about me, it would be that I have unsteady hands. Tasks like nail polishing and lining the eyes with liquid eyeliner don’t come easy for me. The more I have to hold a brush steady, the more likely I would mess up! The mind sure works in mysterious ways. It’s obvious that I love to polish my nails. However, Nail Polish + Unsteady Hands = Mess. There are several ways to clean up the nails after applying polish. Some find using a small brush and pure acetone to be a very effective method. I’m wary of using pure acetone, so I have tried this method before, but with acetone-free nail polish remover. Unfortunately, it didn’t work well for me. It may have been the brush that I used or it may be that this method works best with pure acetone. 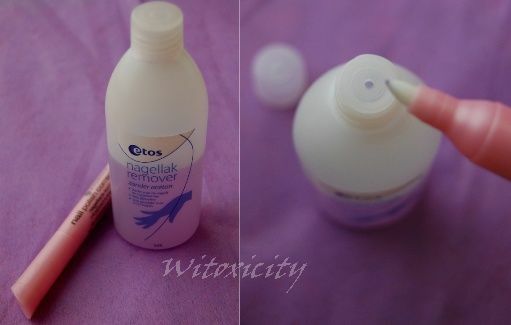 Another way is to use a cotton bud with nail polish remover. I don’t favour this method as (a) I find the tip too fat for precise cleaning, and (b) I hate lint! This brings me to the next best solution: corrector pens. Corrector pens are nothing new and some of you may have been using these for a long time. I discovered these in the store just under a year ago and little did I know then how much I would come to love these pens. 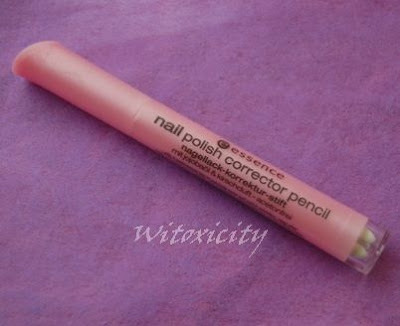 More precisely, the Essence Nail Polish Corrector Pencil. Acetone-free. 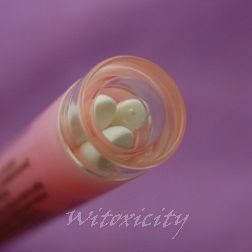 With 3 replacement tips to precisely erase nail polish mistakes. 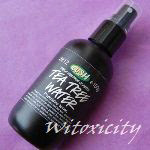 With jojoba oil and cherry fragrance. Alcohol Denat, Butyl Acetate, Isopropyl Alcohol, Water, Ethyl Acetate, Jojoba Seed Oil, Caprylic/Capric Trigylceride, Tocopheryl Acetate, Tristearin, Trilinolenin, Triarachidin, Tripalmitin, Fragrance, Benzyl Alcohol, Eugenol, Cinnamal, Coumarin, Geraniol, Linalool, Citronellol, Limonene. 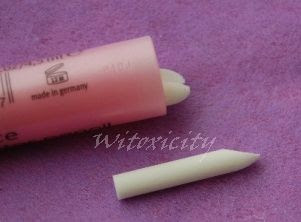 This corrector pen(cil) imparts a strong sweet fragrance, perhaps more sweet than chemical. It costs only around €2.50. Somewhere inside, in the centre of the length of the pen is where the remover is. I think stuffed inside is a kind of soft cushy material that has been pre-soaked with nail polish remover. The white pen tip is damp to the touch as the other end has been pushed in to touch that material soaked with the remover. Essence advises to close the pen tightly after use to prevent it from drying up. As you can see in the images, it has a tip that is curved and doe-foot-like. 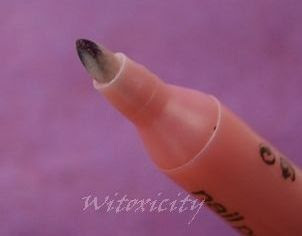 The tip is stiff-ish, which makes it ideal for cleaning up the cuticle area and the sides. I usually do this when the nail polish is almost dry. It’s really as simple as just running the tip in small repeated strokes along the sides of the nail to remove the excess nail polish. It’s inevitable that the tip would take on the colour of your nail polish while it cleans, but it would help to wipe the tip often with a piece of tissue, especially if there is gunk stuck to the tip. I have found that I can get a lot of use from just one tip – it definitely lasts me through at least three manicures. The pen comes with three replacement tips, housed inside the other end of the pen. To replace, just pull out the old tip and push in the new one. Usually, the tip sits very tightly in the pen, so when I have problems pulling it out with my fingers, I would cover the tip with a piece of tissue paper and pull out the tip with a tweezer. It’s best to wait for a few hours to give the new tip time to absorb the remover from inside. 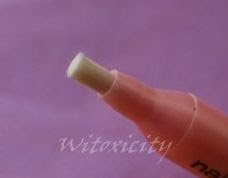 • If for any reason the pen dries out, the tip can still be used for its purpose. Just get it damp with your normal nail polish remover and the tip will do its job just fine. I do however advise getting a nail polish remover with a small hole opening. The one I have is an acetone-free nail polish remover from Etos that didn’t cost a bomb. 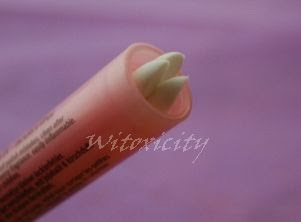 • If you want to extend the use of the tip even more, try turning the tip around. I’ve tried cleaning my nails with this end before and I’ve actually found that it does an even more precise cleaning job! It may be a blunt end, but the cylinder shape has a useful angular edge that is very stiff. Different people have different methods, but this is how I clean up my nails after applying polish. This pen is indispensable. I love it – it’s acetone-free, it delivers on its promise and it’s value-for-money. I highly recommend it. 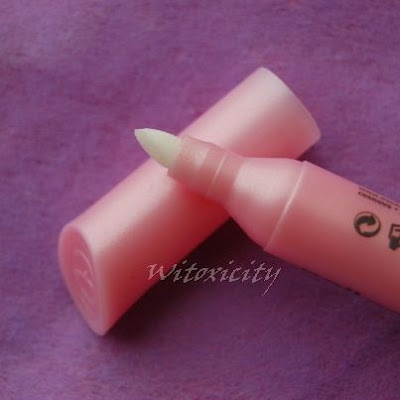 If you haven’t got access to Essence, you could try a similar corrector pen from a brand like Sally Hansen. Love this thing! I got one from a swap last year and use the HECK out of it. You can even pull the tip out and put remover inside. Never thought about turning it around though! duh! I don't care much for how the tip breaks down, but that's my only complaint. Sally Hansen makes this same tool in the states too. I am not sure if this tool is available at Ulta in the states. i face the same problem while applying a varnish..the correcter pen is such a boon in that case! Hm, sadly I find that this pen dries out really quick. I bought this pen like a year ago or something. Really strong sweet smell, indeed. That's a pretty interesting product. I agree with you on the lint, so I obtained a brush specifically for the purpose of cuticle cleanup. This pen looks intriging though. cool tool whenever i apply nail polish! i'm still a bit sloppy but practice makes better coatings i must say :) love the review and the product! This is a useful tool! As I was reading I thought that it only came with one head and that's it. Good that you can replace the head, and also great tip with turning the tip around!